Welcome back from the long weekend — at least, it was one in the States! Tuesday brings work, yes, but never fear: it's the release day for episode 5 of Overdraft: The Orion Offensive, subtitled "Tip from a Dip." Click to subscribe now, or check your Kindle account for it if you've already subscribed. In "Tip from a Dip," things grow a bit more serious for our interstellar sales team. Jamie and Bridget struggle to figure out a way from being crushed by mammoth aliens, and Jamie learns the truth behind what happened at Overland, years earlier. Kolvax's scheming continues, and a new earthly menace enters the scene: one with the power to end the expedition right away! Remember, Overdraft is a Kindle Serial, so if you subscribe at $1.99 any time in the serialization period, you'll get every episode. Folks who subscribe now, for example, will start with Episodes 1-5 and get the next three as they come out. There are resources here on site, including the Overdraft Glossary and the Overdraft Timeline, that you can check out; I'll update them with the Episode 5 material shortly. 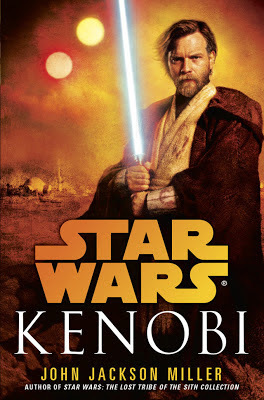 In other news, the Star Wars: Kenobi Advance Reader Copies went out to selected reviewers over the weekend, and I'm gratified by the early response. (Some spoiler free comments here.) I'm hoping to get some copies in soon for giveaway purposes. Stay tuned. And if you didn't hear it, I have a wide-ranging podcast up with Star Wars Bookworms. 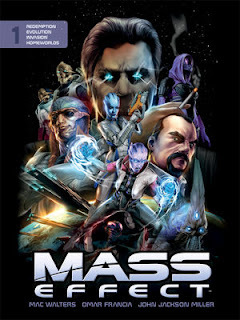 I also neglected to post here when it came out that the Mass Effect Library Edition is now available. This is a mammoth, oversized coffee-table hardcover, which includes all my comics series: Redemption, Evolution, and Invasion, plus the new Homeworlds series and some bonus stories. The volume has annotated pages, with notes from the creative team — and also a section of production art by Omar Francia. It's definitely worth checking out. And tomorrow sees the release of Simpsons Summer Shindig #7 — and I've just seen that my "Railroaded" tale is the lead-off story. All aboard! 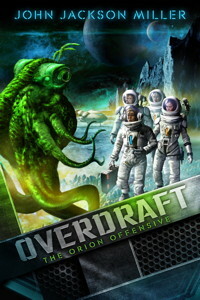 Overdraft: The Orion Offensive Episode 4: "Winner's Curse" now online! Today is Every Other Tuesday again? That means either the Schwann's truck will be by later selling frozen pizza — or that it's the release day for episode 4 of Overdraft: The Orion Offensive, subtitled "Winner's Curse." Click to subscribe now, or check your Kindle account for it if you've already subscribed. In "Winner's Curse," when the competition at the auction cuts out, Jamie and company are left with a dubious prize — the right to face a ravenous space-serpent all alone! Then we find out more about the surprising connection in Jamie and Bridget's past — and pay a call to another world, where Jamie encounters some even heavier problems, so to speak! Remember, Overdraft is a Kindle Serial, so if you subscribe at $1.99 any time in the serialization period, you'll get every episode. Folks who subscribe now, for example, will start with Episodes 1-4 and get the next four as they come out. Yep, we're at the halfway point! Time flies. There are resources here on site, including the Overdraft Glossary and the Overdraft Timeline, that you can check out; I'll update them with the Episode 4 material shortly. Ben—Jedi Master Obi-Wan Kenobi, hero of the Clone Wars, traitor to the Empire, and protector of the galaxy’s last hope—can no more turn his back on evil than he can reject his Jedi training. And when blood is unjustly spilled, innocent lives threatened, and a ruthless opponent unmasked, Ben has no choice but to call on the wisdom of the Jedi—and the formidable power of the Force—in his never-ending fight for justice. As I mentioned on Twitter, the description very much fits. Tatooine is one of the stars of the show — and not someplace where one can simply hide forever unnoticed. There's a western feel to it: it's a close-knit community, and he's very much the outsider, wanting to be anonymous. But that's easier said than achieved, of course, particularly when one has the public-spirited instincts of a Jedi! There's definitely action here, as befits Star Wars — but we also get to see things from a different point of view, as Obi-Wan would say. We've seen the Sith nursing their hatreds, patiently plotting their revenge; now we see a Jedi hero having to prepare for a long vigil, protecting the new hope of the galaxy. It's an interesting place that Obi-Wan finds himself in -- I hope you'll enjoy it. More details as they become available... I would expect that they'll be releasing the cover soon. (Update! They have! See it here.) In the meantime, you can preorder the hardcover from Amazon, Barnes & Noble, Random House, and IndieBound. You can also preorder the audiobook from Amazon and Barnes & Noble. 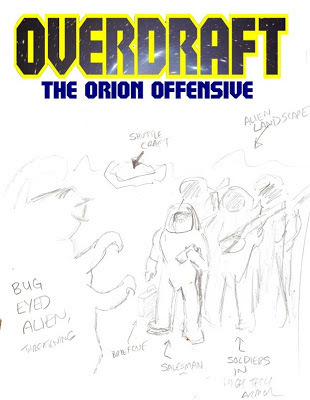 In the meantime, some housekeeping: The third episode of my Kindle Serial, Overdraft: The Orion Offensive is now available; $1.99 gets the entire storyline. And I will be appearing from 1-4 on Saturday at Galaxy Comics in Stevens Point, Wis., for Free Comic Book Day. May the Fourth be with you!